London rockers BLACK ORCHID EMPIRE have released a video for 'Celebrity Summer', the first single taken from their forthcoming album Yugen - out 25th May 2018 via Long Branch Records. "Making the video for 'Celebrity Summer' was a blast - we shot the whole thing in our studio so everything is super in-your-face and intense," says vocalist/guitarist Paul Visser. "Scott Canty from Dark North Media did an incredible job of pushing our performance to the limit as he captured it - he totally destroyed us!" 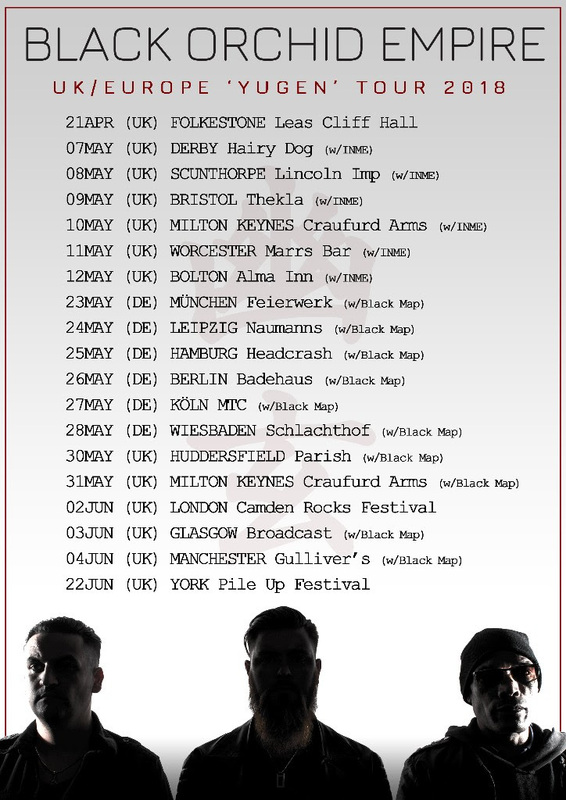 BLACK ORCHID EMPIRE have also announced live dates throughout May and June which sees them play six shows opening for INME in the UK, followed by a ten-date run throughout Germany and the UK as main support for Black Map. BLACK ORCHID EMPIRE create dense, powerful rock music that combines fearless complexity, aggressive heaviness and beautiful, hook-laden melody. With a gargantuan sound and energetic live performance, the three-piece hailing from London have been unleashing their ferociously tight show across Europe, including a UK tour with HED p.e, several headline runs and much-lauded appearances at Standon Calling, Planet Rockstock, Camden Rocks Festival, German Taubertal Festival and more. Their critically-acclaimed debut album Archetype garnered widespread media attention, with single 'God Is Awake' being selected as Kerrang! Radio's track of the week. Having played alongside heavyweights such as Biffy Clyro, Editors and Skunk Anansie and with a dedicated, growing fanbase, BLACK ORCHID EMPIRE demand your attention.